I grew some Teosinte again this year. I was able to plant several different varieties, so i could evaluate them and observe their differences. There seemed to be more differences than similarities, and there were a few traits that were common with some of my Indian Corn that i like to grow. One interesting trait that i occasionally see in my indian corn is where there are some male parts that grow on the very tops of the cobs that in theory could produce pollen to self pollinate. The problem with this trait in corn is that it usually doesn’t seem to function anymore when it does show up, and in most cases never appears at all. Here is a “cob” of Zea mexicana teosinte that has made it to the silking stage and is ready to accept pollen. I’m delighted to have found a variety that has the potential of setting mature seeds here in my garden. Teosinte is native to Mexico, so there are quite a few differences in the length of the growing season between Mexico and Colorado. So far only Zea mexicana and a variety of teosinte called “Northern Tepehuan Maizillo” are the only types to reach the pollen stage here in Colorado; and Zea Mexicana is the only one so far to reach the silking/seed stage. I look forward to trying to grow (and maybe cross) both these varieties next year. This Zea mexicana plant is really close to producing mature seeds, but the plant is dying due to a frost the other night. If i can start some Zea mexicana earlier in the season, then i might have a better chance of getting some mature seeds before winter. I grew a very nice specimen of Zea diploperennis last year, and i hoped it would be able to survive the winter, but it did not reappear this year. I planted some more, but they were in a nutrient deficient spot, and had stunted growth this year. 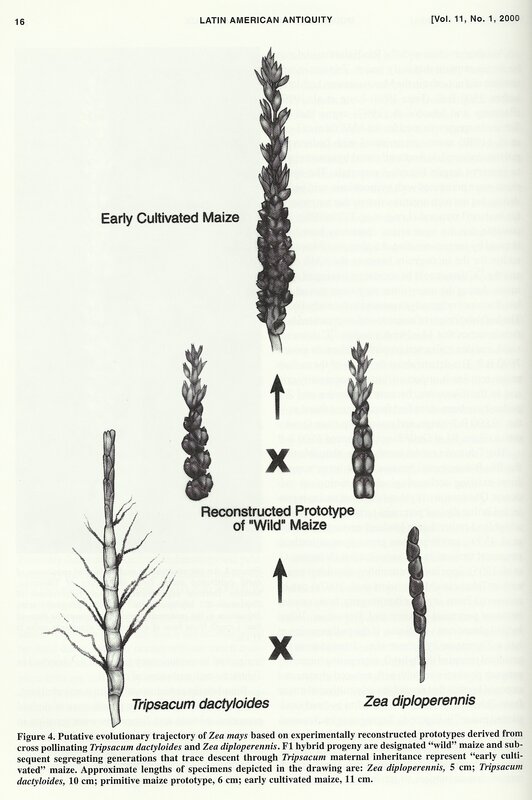 A theory of mine that I’d like to explore sometime in the future has to do with the origin of Corn (Maize). 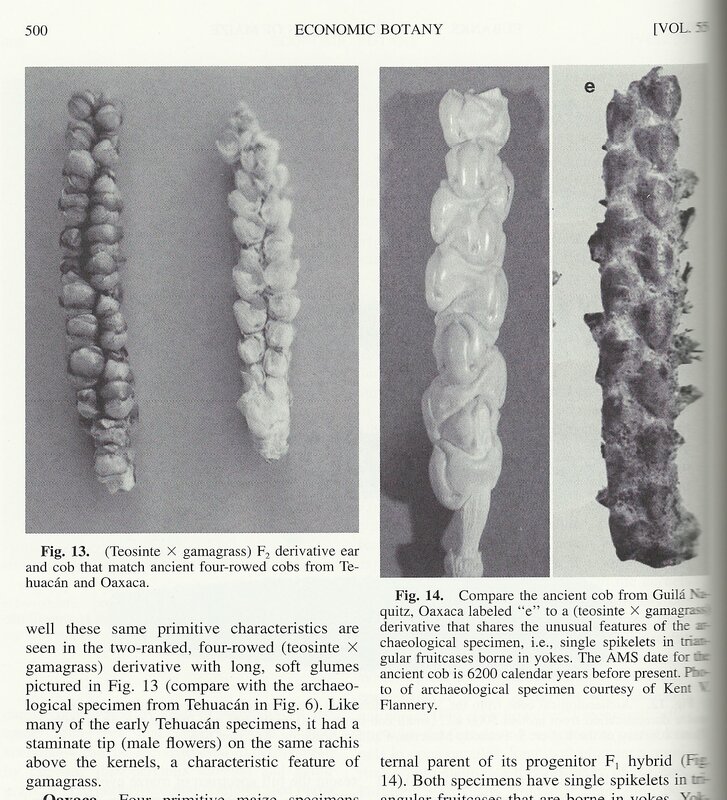 Teosinte is obviously the origin, but there are significant differences in seed shape and cob formation. My current theory is that cobs are an emergent trait that appeared after two distinct teosinte lines crossed. The most likely cross in my mind is one between Zea mexicana and Zea parviglumis. Their ranges come very close to overlapping in several areas. After growing several varieties in my garden this year, i can tell you that strangely Zea mexicana and Zea parviglumis are eerily similar to corn. Zea parviglumis is a tillered teosinte, but it has only has about 6 tillers, but other varieties like Zea diploperennis or Zea huehuetenangensis have like 10 tillers each. Zea mexicana has no tillers. Zea parviglumis is a little short, and Zea mexicana is fairly tall. Theoretically if they were crossed then the resulting hybrid should be the same height as the corn that grows in my garden, and the intermediate growth pattern should also be closer to corn than either parent. Part of my idea of an emergent cob from a teosinte hybridized with another teosinte species is based on the work done by Mary Eubanks. Mary Eubanks has published a few articles about a theory that Gamma Grass (Tripsacum) is one parent of modern corn that hybridized with teosinte a long time ago in Mexico. It’s an interesting theory, but it seems that most geneticists don’t believe Tripsacum is a parent that led to corn. I also have my doubts about it, but the the work done by Mary Eubanks is still important. She has created Tripsacum-Teosinte hybrids at Duke University. Her work shows that when teosinte is hybridized with a similar grass species (Tripsacum) that in F2 generation a primitive 4 rowed cob starts to form and is an emergent trait. Surprisingly there don’t seem to be a lot of pictures of teosinte on the internet. If your interested in seeing a few more pictures of the ones i grew this year in 2011, then by all means visit my photobucket page here. The pictures of teosinte are not individually labeled as to which species is which, but i can tell them apart after growing them. that zea mexicana looks more like zea mays than the northern tepehuan does right down to the way the leaves emerge from the stalk…i will be mulching the heck out of the zea diploperennis i have in beds outdoors but i am not sanguine about its ability to winter over this far north…i will try none the less. yes, modern researchers think that Zea mays ancestor was Zea parviglumis and often in the past they have thought the ancestor might have been Zea mexicana. I personally think modern corn originates from a hybrid between Zea parviglumis and Zea mexicana. Hi, great stuff your doing. I lost my Zea mexicana & I am looking for new seed, do you know of a source? or if you have Z. mexicana seed I can swap some Z. diploperennis. Thanks for the corn blog. I actually already have some seeds left on Z. diploperennis for now, so i dont need any more yet. I’ve got some seeds left on Zea mexicana, but not really enough to trade. The only source i know of is from the USDA GRIN source directly. That is where i requested my seeds two years ago. My Z. mexicana seeds were from the Accession # PI 566677, but there are other accessions you can request seeds from. Thanks very much. My Z. diploperennis is just showing the female silk for the first time in ages, i found dividing the rhizomes really ramps up the vegetative growth & plant vigour. Great blog ! I have started several Diploperennis seeds in my greenhouse this winter and look forward to conducting more research into its growing habit and possible over wintering outside in my zone7 climate on the east coast.I will continue to make posts over the next several months on my blog and website: Sustainable edibles.com . Thank you for putting this online because there is very limited info on such important plants. Keep up the great work! Thanks Christopher, yeah i know what you mean. Very limited info indeed. I’m in zone 5a here, and the zea diploperennis has so far been unable to overwinter the two times i’ve grown it, but i havn’t given up hope yet. It might be possible in zone 7 though, so i commend you on your effort! Since you commented on my post i think i will create a brief post showing the differences between the teosinte species i grew the one year. Unfortunately my picture of zea diploperennis was in a growth stunted spot, so the photo does not do that one justice. I would sow yout teosinte as soon as your growing season allows. Teosine is similar growing to maize or corn, and requires a summer growing season with roughly the same amount of heat. Teosinte however generally requires a longer growing season however to set seed. I would think Nepal would be an excellent place to grow teosinte. I need to grow teosinte (mexicana and diploperennis) to get some seeds in argentina. What would be the better condiciones of temperature and light to do it?. Thank you. I grow in Northern Colorado in the USA. Both Zea mexicana and Zea diploperennis are native to central america and in my climate need a slightly longer growing season than what i have. Zea mexicana is closest to setting viable seed though. I would recommend growing in a greenhouse in an attempt to extend your growing season depending on where you live in argentina. This is by far the most helpful info on the internet that I’ve found on this topic to date, a thoughtful overview of the various teosinte types with details on your growout trials too. Please keep posting, I’ve added your blog to my favorites list for sure!